Ever wondered how you can add a vignette effects to your images? Well, there are lots of tools that can help you add those amazing vignette effects in your images and the beauty is that you do not necessarily need to download and install any software. There are some excellent online tools that can help you add vignette effects like a pro. In this regards, we have compiled a list of some of the top online tools you can go for. Let’s delve in! What The Heck is Vignetting? For starters, vignetting is a technique in photography and image editing whereby you reduce the brightness or saturation of a photo at the periphery when compared to that at the center of the pic. It may be a blooper in photography but it’s a spectacular way to introduce creativity in editing with the aim of focusing the viewer on the center of the photo. Photo editing experts use lens correction filter in Photoshop to achieve this but what’s even cooler is that you can use some online tools to do the same job, even faster! Lunapic has got to be the first name on this list and it’s not by a fluke. It is a free online editing platform with lots of tools with one of them being the Vignette effect tool. Perhaps the attractive bit with this online tool is that all you need is to upload your image, add the vignette effect and you are good to go. You can also customize your vignette border fade by simply tweaking the Radius and the Sigma values to get the kind of effect you are looking for. Perfect simplicity! Canva needs no introduction to anyone who loves editing photos out of the web. It’s actually one of the best editing platforms around and it shouldn’t come as a surprise that it has a great tool for adding vignette filter to your coveted photos. Adding a vignette filter to your photo is just a matter of adjusting the vignette slider to find the level of effect you fancy. This is yet another simple but great tool to add vignette effects to your photos. As a matter of fact, all you need is to upload your photo from your PC, set the vignette filter and save your photos. You can also share the edited photos to your favorite social media platforms directly from the Fotoram editor. It’s super simple to add the Vignette filter-even the novice can do it! Fotojet is a one-stop shop for matters design, collage and photo editing. One of the best tools in the package is the vignette effect tool where you can pick a color, tweak the intensity to style your photos. For instance, you can produce effects like custom lomo effects with the vigenette effects. pho.to is a place to not only fish for hundreds of photo frames, effects, and filters but you can also spice up your images using a nice vignette border. It’s a breeze-pick your photo from your folder, URL or Facebook account and add the vignette effect in seconds! Photo-kako is a very popular online editing tool among Japanese speakers but it can also come in handy for English speakers as well. All you need to do is pick the English version and you can enjoy it. Now, it has Vignette effects tool that you can leverage to enhance the look and feel of your photos. This is an online tool with lots of features that emulate the camera and lens related characteristics. Of course, one of them is the vignette effect tool that affords you the ability to use different color tints-not just the dark ones. There is also the option of going for a two-colored vignette, a black and white vignette or a blurred vignette. BeFunky is actually one of the best tools you can use to add vignette effects to your photos. Wondering why? It gives you the opportunity of customizing the effects in a way that many other tools won’t. You can make your vignette you can pick a circular outline, square or straight outlines. This is just the tip of the iceberg but there are tutorials to guide you through starting out. 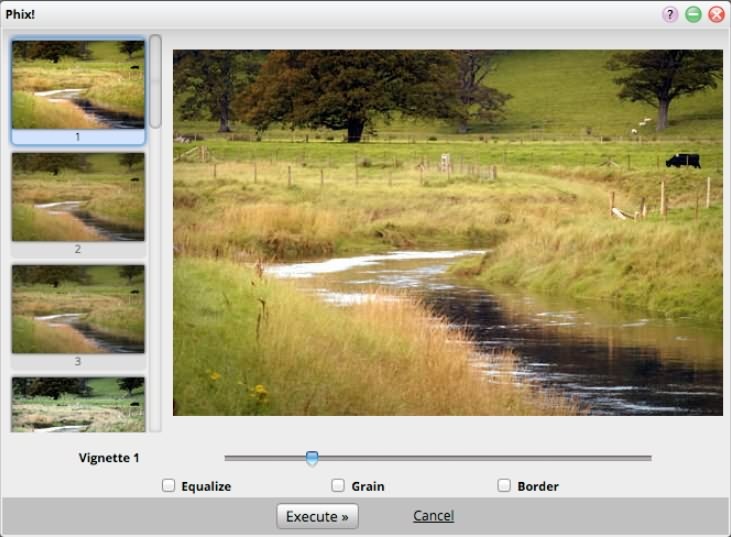 PineTools has very simple but effective vignette effect editor online and it will take you seconds to get the effects applied to your images. It has two easy options to adjust the effects-size and strength. Last but not least, there is w3goodies.com- a tool that allows you to apply vignette effects on GIF images. All you need to do is upload your file, pick the black and white points coupled with the X and Y offset values, select background color and click on “Apply Effect”. It’s that easy! There you have it! These are some of the best online tools to apply vignette effects to your photos. There are many out there but these ones stand a cut above the rest. Most of them are free and very easy to use! Who said you need pro tools to get those cool effects on your photos? Adding vignette effects to photos with online tools is easy, however, there may be some limitations when you want to add more effects or edit your photo further. Here, we recommend you to use Wondershare Fotophire. You can use Fotophire on your Windows 7/8/10 without any concerns. You can add more than 200 photo effects to your photo, including vignette , black and white , and double exposure . You can also remove image background or remove unwanted objects easily without affecting the original image quality.